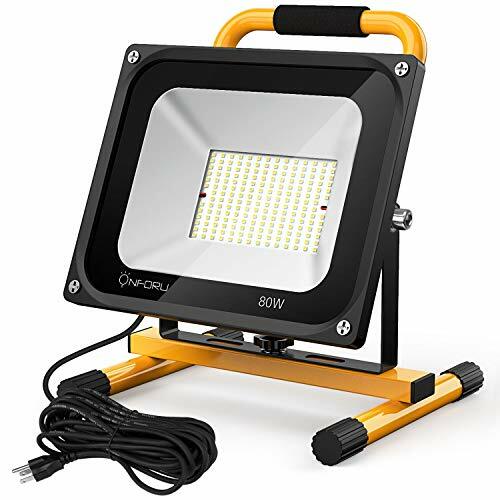 SUPER BRIGHT & 2 BRIGHTNESS LEVELS: With 168 ultra-bright LEDs and 120°beam angle, can produce up to 7600lm high brightness clear white light; 2 Brightness Levels design allows you to easily adjust the power from 40W to 80W depending on your requirements. IP65 WATERPROOF: Highly light transmittance, impact resistant tempered glass panel perfectly fits the aluminum alloy body, and the ON/OFF switch with Sealed design, both achieving IP65 waterproof and dustproof rating, ideal supplies for Building Construction and Mining. FLEXIBLE & EFFICIENT COOLING: Thanks for the stable stand, the work light can be rotated horizontally by 360 ° and vertically by 150 °, Portable and Flexible; The unique aluminum housing and finned heat sink can dissipate the heat efficiently. 100% SATISFACTION GUARANTEE: Onforu offer you fast and satisfactory customer service. 30-day money back and 5-year product warranty is always included, so you can buy with confidence!